No single person came close to generating health care-related coverage the way President Obama did. In the period from June 2009 through March 2010, he was a lead newsmaker in 22% of all the stories about health care. (To be a lead newsmaker, someone must be featured in at least 50% of a story.) His closest competitor, Senate Majority Leader Harry Reid, was way back, a lead newsmaker in just 2% of the stories. But those numbers don’t tell the whole story. 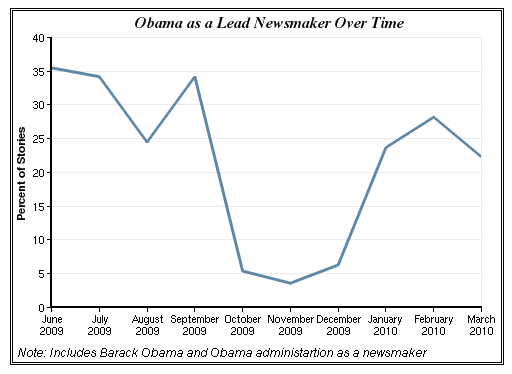 A breakdown of lead newsmaker coverage reveals a fluctuating role for the President. He began by completely dominating coverage in the summer of 2009. But by the fall, he had largely slipped out of the headlines as key legislators figured more in the narrative. Once the calendar turned over to 2010, the President again emerged as the driving newsmaker in the story. In June 2009, as Obama took to the road to begin aggressively selling health care reform, he was the lead newsmaker in 35% of the health care stories. That number remained almost the same—34%—in July as Obama held a crucial July 22 press conference on the subject. His coverage sagged a bit to 24% in August, a month in which the town hall face-offs accounted for more than one-fifth of the health care coverage. It moved back up to 34% in September, the month of Obama’s big prime-time televised address. (The second-leading newsmaker that month, at 9%, was Obama heckler Joe Wilson.). But by October, as the focus of the health care debate moved to Capitol Hill, the President’s coverage plummeted. That month, he was essentially tied with Harry Reid as lead newsmaker at 5%. Close behind (4%) was Maine Republican Senator Olympia Snowe, a moderate who had voted for health care reform as a member of the Senate Finance Committee. The next month, Reid edged the President although both were lead newsmakers in 4% of the stories. Former President Bill Clinton, who went to Capitol Hill, to give Senate Democrats a pep talk on the need to pass legislation, was right behind them, a lead newsmaker in 3% of the stories. In December, a pivotal health care swing voter, independent Senator Joe Lieberman, generated almost as much attention (5%) as Obama (6%). Two Democratic senators who were also crucial players in the debate—Reid and Nebraska’s Ben Nelson—each registered at 3%. But in 2010, as Obama resuscitated a health care bill that seemed dead after Scott Brown’s Senate victory, he once again became the focal point of the story. In January, he was a lead newsmaker in 24% of the health care stories, a number that increased to 28% in February and dipped modestly to 22% in March. Tellingly, in each of those three months no other public official was a lead newsmaker in more than 3% of the stories. Obama’s trajectory as a health care newsmaker reflected the political dynamic of the battle. In early summer, he emerged as the chief pitchman for the legislation. He receded from the narrative as the action moved to Capitol Hill and prospects for passage bogged down. In early 2010, when he reasserted himself, or at least the coverage suggested his larger presence, and he personally staked his reputation on it, legislation passed. At times during the health care debate, some critics faulted Obama for not getting actively enough involved and ceding too much of the heavy lifting to Congress. An analysis of the media coverage at least suggests that the Democrats’ legislation fared better when Obama actively carried the ball.